DEWALT® XR FLEXVOLT™ - Our innovative voltage-changing battery powers both 18V and our NEW groundbreaking 54V XR tools, paving the way to the jobsite of the future. 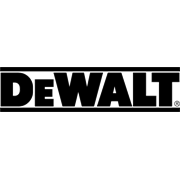 DEWALT XR FLEXVOLT™ is the only battery on the market that can switch from 54V to 18V, making it backward-compatible with your existing XR power tools. 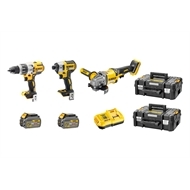 Kit Includes: DCD996 Hammer Drill, DCF887 Impact driver, DCG414 Grinder, 2 x DEWALT® XR FLEXVOLT™ Battery Pack 6.0 Amp Hour, DCB118-XE XR Fast Charger, 2 x Heavy Duty DWST1-70703 TSTAK™ Kit Box. Heavy Duty DCD996 18V XRP BRUSHLESS 3 Speed Hammer Drill/Driver with 820 UWO Power features a 60 Lumen LED Light and all metal gearbox. DCF887 18V XR Brushless Li-Ion 3 Speed Impact Driver with 205Nm Torque with exceptional driving power as well as the ability to reduce both speed and impact energy for lighter applications. DCG414 Grinder 125mm has a powerful brushless 54V motor equivalent to 1500W corded grinder and can complete light, medium and heavy loads never before possible with cordless angle grinder. TSTAK boxes have large comfortable handles, rugged and hard wearing metal latches for improved durability and interlocks perfectly over other TSTAK boxes. DEWALT® XR FLEXVOLT™ voltage changing batteries give you the power of corded, freedom of the cordless.